– Conclusion: Take some of your savings and wealth off line? Your money in your bank account can vanish. That is the lesson from yesterday’s enormous screw-up by Ulster Bank that saw payments and bank account balances suddenly vanish. Customers were left out of pocket and struggling for funds. Payments including salaries were not made, cards were declined and customers were unable to pay for urgent goods and services. Ulster Bank has blamed the issue on ‘human error’ and claims this morning that the issue has been rectified. Although it has taken some customers four days to be able to make urgent payments. This was a weekend of bank ‘errors’. In the UK, TSB faced a ‘meltdown’ after scheduled IT maintenance went somewhat awry. Many customers found themselves unable to access their accounts, whilst some even had access to other peoples’ money. The fallout will last for some time. We have all fallen victim to bank charges at some point or another – whether for missed direct debits or unauthorised overdraft charges. Lets hope that the onus will not be on the customers to prove that it is not their fault that their account and their balances are not what they should be. Credit scores and ratings could be damaged and relationships with individuals’ creditors may be impacted. Rather than be seen as an inconvenience for customers, bank users everywhere should see this as a reminder that ‘money’ in the form of digital pounds, euros, dollars and other fiat currencies can just ‘disappear’ whether due to human error or more nefarious causes such as hacking. This weekend’s ‘magic money moments’ in both Ireland and the UK are the most recent example of something we have long discussed – cash in the bank is not your cash. You are an unsecured creditor and your cash can just disappear and there is very little you can do about it. You can make a lot of noise on Twitter, Facebook and in the media and sometimes that may work but not with a lasting impact. The customers of both Ulster Bank and TSB can rant on Twitter or shout down helplines all they like but legally they have very little rights when it comes to accessing their money. This week politicians have enjoyed their soapbox moments, demanding investigations be done, apologies be made and new regulations to prevent this from happening again. Sadly we all know that by the end of the week this news will be Friday night’s kebab paper. Banking customers will have lost motivation and politicians will have found another righteous cause. The simple fact is that banks hold far more power over the cash in your bank account than you or any other party. Some will decide to change banks (guaranteed not as many as said they would) but it will be a difference in name only. Cash, savings and pensions will still be held in the inter-connected web that is the global financial and banking system and no one’s rights will have improved. From one bank to the next, the risks to cash still remain. Disappearing cash is a reality which will likely come to bank accounts everywhere with increasing frequency. Whilst it not might not feel like it to those inconvenienced this weekend, a banking problem caused by a fat-fingered or forgetful human is the best kind of problem a banking customer can have. However these are rare compared to the number of malicious attacks from outside sources which are silent in their assaults and lengthy in their recovery time. Banks are consistently playing catch-up to the potential threats that they face on an hour-by-hour basis. Last month financial watchdog FINMA warned Swiss banks that the biggest threat they face are cyber attacks. The threat is so great that Switzerland has been called upon to step up its national defence of cyber warfare. UK banks alone spent $360m on IT in 2016, but the report said approaches are often slow and constrained by regulation, while cyber criminals, who can operate beyond borders and the law, are constantly updating their methods. EU regulators agree that IT systems are slow and out of date. A report this month by the Joint Committee of the European Supervisory Authorities (ESAs) concluded that cyber security attacks are considered alongside Brexit as the biggest threat to the securities, banking and insurance sectors. Many of us imagine hacking and malware to come courtesy of an under-socialised teenager who lives in his mother’s spare bedroom. This is no longer the case. Sadly cyber-warfare is a growing business and one that is for hire. Following sanctions on Russia and wildly flung accusations regarding poisoning and participation in chemical attacks many are now more concerned about cyber terror and war and the ability of all nation states to make life online a real misery. EU regulations – more nefarious than the hackers? After more than two decades of the internet most of us are vaguely aware of the threats it brings (although few do anything about it). What we have not accepted quite yet are the threats brought about by the very same people who are supposed to protect us – governments and regulators. These two mega powers overshadow your savings as much (if not more so) than hackers and cyber war. Money can disappear courtesy of governments and regulators not because of human error or malware gone awry but because they have in recent years created laws that allow them to do so. 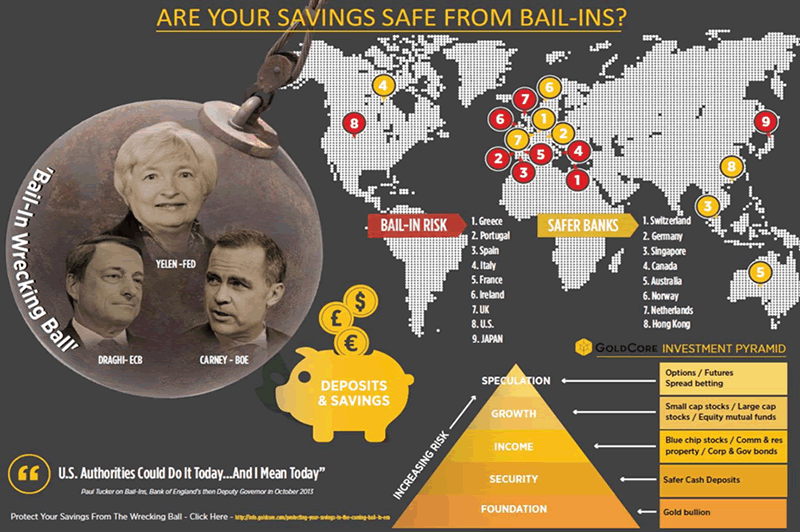 Bail-ins were approved just over two years ago. It effectively means that depositors’ cash can be taken in order to prop up individual banks and the banking system. How much is taken, if it is returned to you and what access to funds you may soon be at the discretion of the banks and central banks who control the regulators. Imagine waking up this weekend to find no money in your account. A quick check of the news and emails does not alert you to any problems with the bank’s IT or of a malware attack or indeed of “human error”. Instead you are horrified to learn that your own government has sanctioned the taking of your savings some of which you need as your day-to-day living expenses. The lesson here is that investors, savers and indeed companies should consider taking some of their hard earned savings and capital ‘off line’. It is nearly impossible to operate day-to-day without a bank account, but for the long-term you can certainly make sure your pension cash and savings are better protected from the number of risks which now face digital assets including digital deposits. Physical gold that is allocated and segregated is about as out-of-the-system as you can get when it comes to investments and savings. Of course you can hide some cash under the mattress lor in a safe deposit box but even this is not safe from the decisions made on-high by central banks and governments. Cash notes in your house are at risk of theft and cash notes in safe deposit boxes are at risk of theft as was seen in the Hatton Garden robbery and indeed raids by police on safe deposit box providers suspected of not running their companies in the safest of ways, not being AML compliant and of potentially aiding criminals. This happened with the Park Lane safe deposit box provider in 2008. Cash is consistently losing value especially in this time of record low interest rates and indeed negative interest rates. Another risk is that cash notes can be deemed non-legal tender and new notes or coins can be created to simply replace those you hold. When it comes to physical gold, it does not rely on your banks IT or having to comply with IT updates or indeed having the safest chip in your smartphone. Gold is becoming more relevant today than ever before because of these risks. But it is specifically allocated, segregated physical gold which will protect from these risks – not paper gold, digital gold or platform gold. Owning gold coins and bars either in one’s possession or in allocated and segregated storage will protect people and will be accessible, liquid and keenly priced in terms of premiums. It will protect investors and savers and those who use online banking from malicious attacks, ‘human errors’ and bank bail-ins. The Ulster Bank debacle is the most recent example of this and it shows these risks are very real and not set to go away anytime soon.